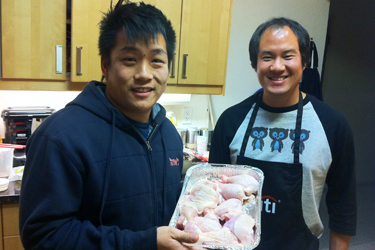 Tonight, Nick made another one of his special monthly dinners for me, and part of it was barbecued chicken (it was Thomas Keller’s special recipe he created for his dad). 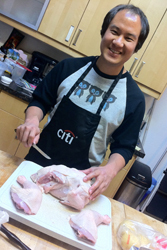 The recipe included cutting a chicken into 8 pieces, and the Ad Hoc at Home cookbook details both an 8-piece and a 10-piece cut technique. 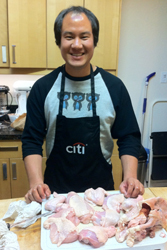 I had never “formally” learned how to cut up a chicken (I learned from my mom and grandma), so I checked out the techniques in the cookbook. Cool, ha ha ha, my family hadn’t steered me wrong. Our friend Aaron is over for dinner (and to play sous chef for Nick), and I know one thing that’s a pain when cooking with an actual cookbook (especially when it comes to new techniques) is trying to go between getting in there cooking (and getting dirty), and flipping through cookbook pages; so I decided I’d try my hand at teaching someone else a chicken cutting technique! 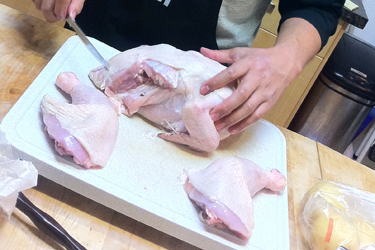 First, you massage the chicken. Just kidding! It’s important to find the joints of the pieces, so you know where to cut through. 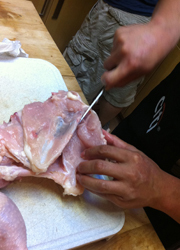 Here I’m showing Aar where to find the joints at the drumsticks. 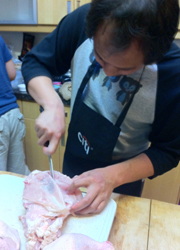 As you cut, you can also bend the joint opposite the way it normally bends to separate it a bit, then cut through. 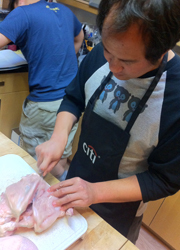 This is probably the trickiest thing about cutting up a chicken, but it’s not hard to get the hang of. 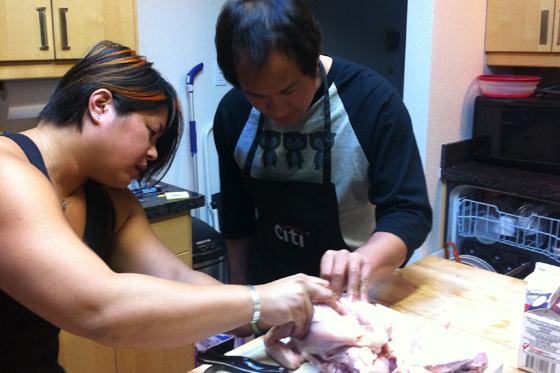 I cut one thigh/drumstick off, and then Aar did the other side – and he did great! 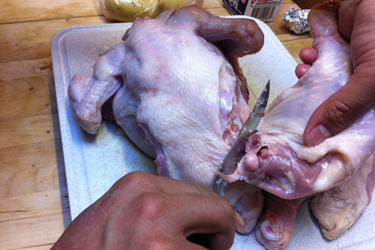 Next, I showed him how to find and follow the cartilage line down the middle of the breast of the chicken and carefully cut down that to remove the breasts. Again, he did a great job! After that, using the same joint-finding techniques we used above, we separated the wings from the carcass, and separated the drums from the thighs. Eight pieces of chicken deliciousness!